The seed of ‘Goya: The Portraits’, opening this October at London’s National Gallery, was sown in 2001 when I organised a one-room exhibition at the National Gallery focused on one of Goya’s (1746–1828) great portrait masterpieces, The Family of the Infante Don Luis (1783–84). Not unlike a scene taken from Mozart’s The Marriage of Figaro, Goya shows Don Luis and his family engaged in their daily routine, but with an undertone of intrigue. The lady of the house, María Teresa de Vallabriga, is having her hair done by her coiffeur, while her husband Don Luis (32 years her senior) plays a game of solitaire. Looking on are an assortment of servants and members of the household, including their three young children, and Goya himself at his canvas, painting the scene we see before us. Out of context, it is the most peculiar painting. Who is the main subject of this picture? Is it Don Luis or his young beautiful wife? Why is one of the servants smiling? Or is it about Goya and his ambitions as an artist? I was captivated by Goya’s simple yet sophisticated way of turning portraiture upside down. This was Goya’s first official portrait commission, which he received relatively late in his career, at the age of 38; yet he would carry on painting portraits right up until his death, aged 82. An exhibition of his portraits had to be mounted. Goya produced around 160 portraits, a third of his painted oeuvre. The majority are still in Spain, mainly in the Prado, but also in lesser-known collections such as the Bank of Spain and the Academy of Fine Arts, as well as provincial museums in Bilbao, Pamplona, Seville, Valencia, and Zaragoza. I had to be selective and make sure each portrait would document his development as an artist and also demonstrate the extent to which one could get closer to him as a person through the portraits he painted. Of the 69 that will come to London, each one – and Goya never repeated himself or fell into the trap of becoming a society portrait painter – reveals something about Goya the man and artist – be it ambition, respect, fascination, love, or friendship. Seeing them all together will, I hope, be like the leaving party of a good colleague who has worked in an institution for a long time. The Prado was extremely generous, lending 10 portraits which form the backbone of the exhibition. The rest came from searching for portraits that are now in public and private collections in America, England, France, Switzerland and Italy. I even learnt how to shoot pheasant and partridge – a pastime for which Goya had a passion – as a way of better understanding the artist, and as a way of convincing Spanish aristocrats to lend portraits of their ancestors. A magnificent pair of works travelling to London, for example, will be those depicting the Count and Countess of Fernán Nuñez, which still belong to their heirs. 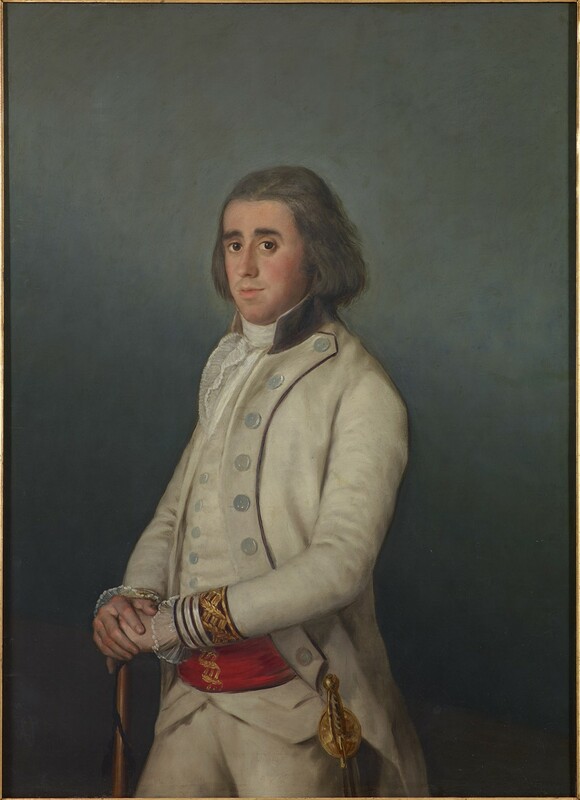 But perhaps the greatest coup is the portrait of a young military officer of whom little is known, Don Valentín Bellvís de Moncada y Pizarro (c. 1795). Hidden away with the heirs until now, and never before seen in public, the canvas suddenly appeared out of nowhere when it was sold to the Fondo Cultural Villar Mir in 2012, an impressive collection of Old Master paintings that hangs on the 53rd floor of a skyscraper in Madrid. The work is a masterpiece for two reasons: the way Valentín’s white jacket is painted, which looks forward to Whistler’s Woman in White (1862), and the fact that he looks so personable – he could be a waiter in one of Madrid’s cafes. Perhaps the most difficult portraits to borrow were those that represent sitters that are as famous as Goya. The portraits of Carlos IV and María Luisa, King and Queen of Spain, for example, still hang in Madrid’s Royal Palace and are on the itinerary for visiting foreign dignitaries who have come to meet the present King of Spain. Fortunately, ambassadorial and monarchical relations between Britain and Spain remain strong and have allowed the pair to leave for the first time. These are key Goya works: they were painted in 1799 and mark his ascent to the position of First Court Painter to the King, a post he had longed for and that had not been filled by a Spaniard since Velázquez in the 17th century. 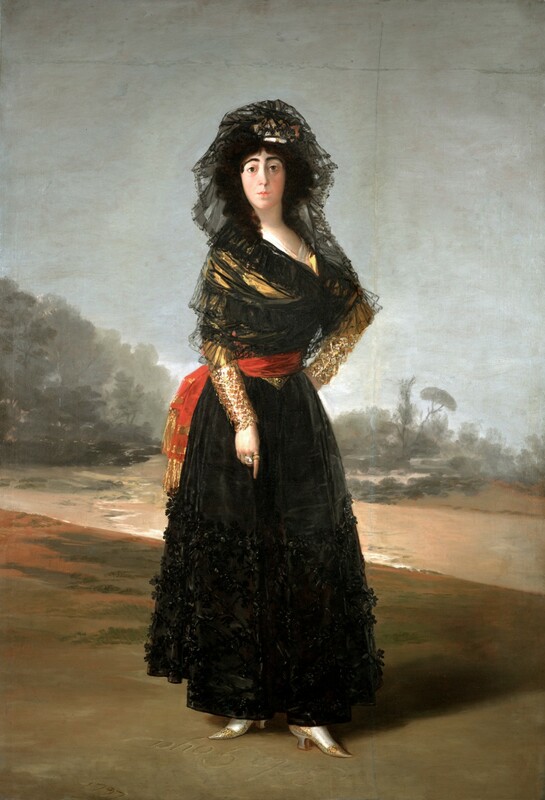 And there is of course the Duchess of Alba, of which there are only two portraits – one that still belongs to the family, showing her dressed in white, and the other depicting her in a black mantilla (Fig. 3), which can be seen in the Hispanic Society of America, one of New York’s hidden gems – full of Spanish paintings and sculptures. Technically it does not travel, but amazingly it will join Goya’s friends and patrons in London. Please don’t ask me how we did it! Goya: The Portraits is at the National Gallery, London from 7 October–10 January 2016. Seriously, though, how did you do it if it’s not supposed to travel?